Hello again Family and Friends! Great news – our middle daughter, Nikki, became engaged to Dan Pokora recently. We are thrilled! We love Dan and both Dan and his family are wonderful. We look forward to their upcoming wedding. It’s been almost a month since our last post. We have been having great fun! We hope all is well in your worlds! We have to keep pinching ourselves to be sure that what we are doing and seeing is real. We are so grateful to be on this journey. So what have we been doing? 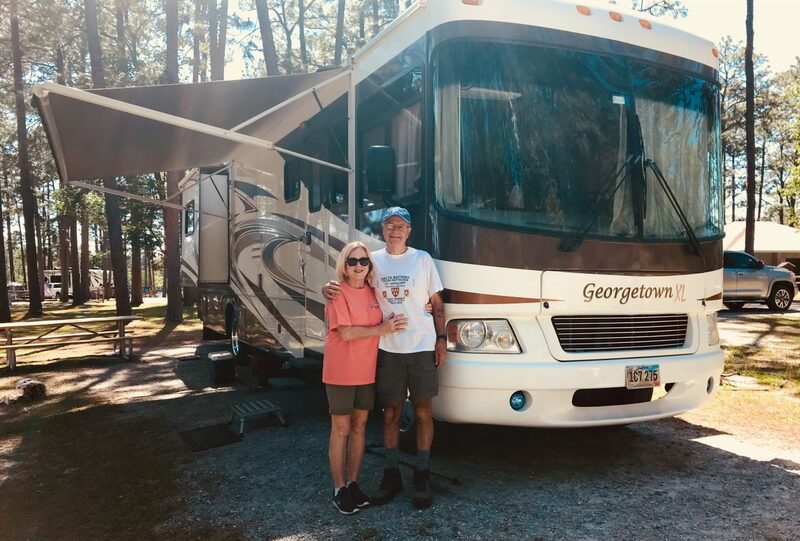 For the past few weeks, we have been tagging along on our good friends and longtime camping buddies, Susan and Mike Seaback’s vacation. They had planned a trip to Glacier National Park, Waterton Lakes National Park (and variety of other areas in Canada), the Tetons, and Yellowstone National Park. We joined them for all but their days in Canada. We went first to West and East Glacier, then we separated (they went to Canada and we visited some other locations as we traveled toward Yellowstone), reconnected for Yellowstone, the Tetons and wrapped up this memorable vacation in West Yellowstone. So, as you can imagine, we’ve been quite busy. 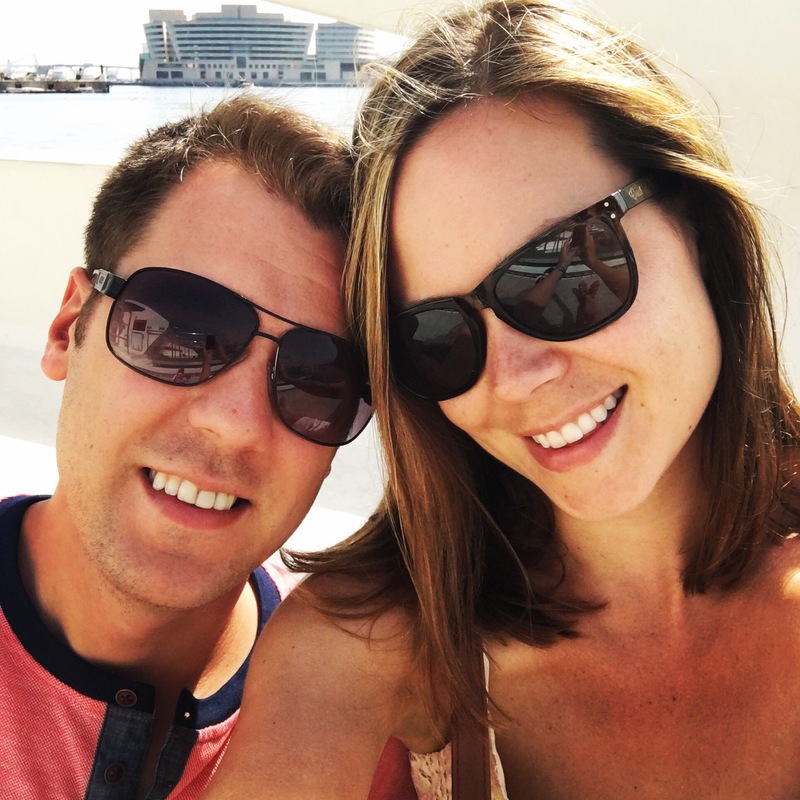 Susan, the ultimate vacation planner, had developed a flexible itinerary and off we went. Of note: If you haven’t been to these National Parks, we suggest that you put them on your bucket list, in particular, we fell in love with Yellowstone. 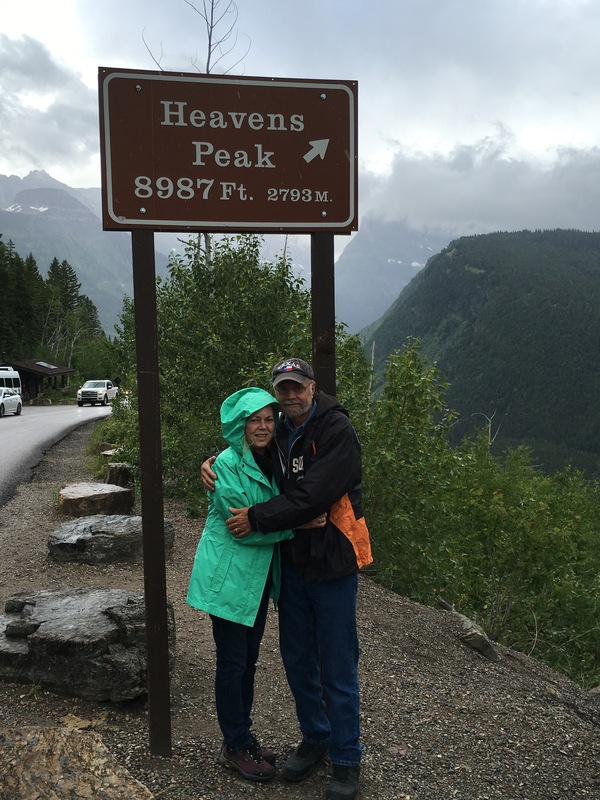 In East Glacier, we took a number of fun hikes with Susan and Mike (St. Mary Falls, Virginia Falls, and Swiftcurrent Lake). For the Swiftcurrent Lake trail, it was so cold that we purchased gloves and warmer socks at Many Glacier Lodge. Mike and Susan headed to Canada and Kenny and I stayed in East Glacier for a few more days. We hiked the Red Eagle Trail where three other hikers joined us when they found out there was a bear in the area. We had the bear bells and bear spray and they didn’t. Pine Creek Trail brought us to a sparkling waterfall. Kenny and I also hiked the Otokomi Lake Trail. Rated as strenuous due to the steepness of the trail, it wasn’t too bad. Some last minute wildflowers were blooming and we had glorious views of the river as we headed toward the Lake. But when thunder boomed and rain started, I headed down the mountain fast – my new fear, FFF (fear of flash floods), took over. We weren’t in any danger but I wasn’t convinced. Our last hike in the area was Beaver Pond Nature trail, which was also very steep, had picturesque views of Yellowtail Dam. There was a swinging bridge that you had to cross to get over a stream – newly constructed, it was quite pretty. Leaving East Glacier and beginning to meander toward Yellowstone, our first stop was Great Falls, MT. We had a enjoyable bike ride on the trail that runs along the Missouri River – beautiful! We started at the Louis and Clark Interpretive Center. If ever in Great Falls, stop there. It’s very informative and had exceptional displays, exhibits, and presentations. We also popped into the C. M. Russell Museum. What a find the museum was! It was apparent that Charley was quite a character, had a great sense of humor and started sculpting and painting at an early age. Great museum. We loved it! Our next stop was Big Timber/Greycliff. There was a State Park very close to our site so we went to Greycliff Prairie Dog Town State Park seeking an easy trail or nature walk. We dutifully paid the entrance fee to discover that the entire park was specifically established to protect prairie dogs. There were hundreds of prairie dogs which are pretty funny to watch. Alas, there were no trails anywhere just curious little heads peeking out of their homes and sounding the alarm of potential danger. Mommas and their babies were playing and as we approached, the Momma would grab the babies and drop them into their burrow. Very amusing! Check it out on the web. 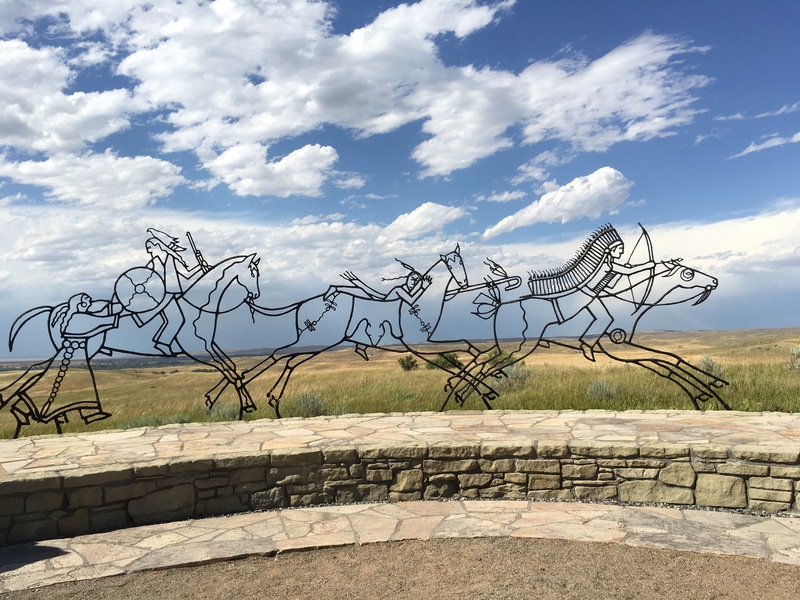 Before reconnecting with Mike and Susan, we spent the day at Little Bighorn Monument. It was a destination I wasn’t particularly interested in seeing but it was historical, informative, and a very sobering monument. Mike and Susan returned and our busy adventures continued! Hooray! In Yellowstone, we visited Mammoth Hot Springs, Norris Geyser Basin, Mud Volcanos, West Thumb, Upper Geyser Basin (saw Old Faithful and the Beehive Geyser erupting at the same time – we also witnessed the Riverside Geyser erupt spewing water hundreds of feet in the air for 20 minutes), and we hiked several trails, Artist Point at the Grand Canyon of Yellowstone, Taggart Lake, and Storm Point. The Upper and Lower Falls in Grand Canyon of Yellowstone served up some perfect pictures. Prismatic Springs was extraordinary. The beauty of this glorious spring cannot be captured by a camera. It seemed to be alive. 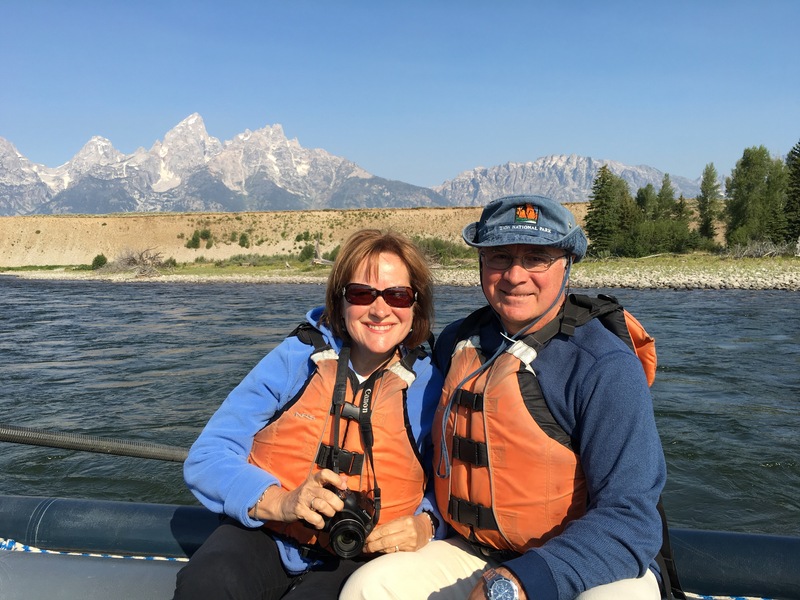 In the Tetons, we took an early a.m. float ride down Snake River – so peaceful and fun! We also visited Jackson Hole and took advantage of a boat tour of the Tetons on Jackson Lake. On a fun note, we had to board Uma during our time there. She stayed in a run with a bed and TV, had open play time with other boarders, and Yappy Hour every day at 3:00. A bit pricey but the only game in town. We believe she watched the Democratic Convention. Bison – at Mud Volcanos one came up behind us that we didn’t see until we turned around; another that walked by our car so close that if I opened the window I could have touched him/her and, another that greeted us as we started our hike to Storm Point and he/she decided to welcome us back to the meadows when we completed the hike. We had to blaze our own trail for a bit to keep far away from that Bison. That was a bit scary. Elk – We were surprised at how many Elk hung out in Mammoth Springs. They were all over the place, taking over the town, and oblivious to the tourists taking their pictures. It was rather odd. It just seemed wrong that wildlife were comfortable in a crowded town lounging on the town square. Bears and Wolves – Visit the Grizzly Bear and Wolves Discovery Center in West Yellowstone. What a fantastic center! A must to visit! What was the best part of our journeys? I guess we have to say making memories with our friends. Thank you Susan and Mike for all of the fun we had with you. Next stop is Oregon to visit Patty and Peter R.
To live on in the hearts of those we leave behind, is not to die. Dear, wild, Sabrina, Rock the heavens. Hi Friends and Family, We hope all is well in your worlds! It’s been some time since our last post. To get caught up, we have summarized our journeys. June 30 was a particularly memorable day for Ken and I. Went to Tupelo to visit Kenny’s old army buddie, Artie and his girlfriend, Betty. Great time seeing them. Next, Carlsbad Caverns and Flight of the Bats in the amphitheater. In our opinion, Cathedral Caverns was more decorative and colorful but amazed at the rock formations and size of the rooms. Flight of the Bats a must see – a tornado of bats swooping out of the mouth of the Caverns, then spinning out of the tornado off to capture their dinner. Much more spectacular than those we saw in AL. In Carlsbad we also visited Living Desert Zoo and Gardens State Park. Gorgeous zoo and large, beautifully landscaped enclosures, botanical gardens, 1.3 mile self guided walking tour. Loved the baby prairie dogs. Tuscan – Visited cousins, the Nelsons and Astons, so great reconnecting and seeing that the kiddies have grown up to be amazing adults! Hiked Sabino Canyon. 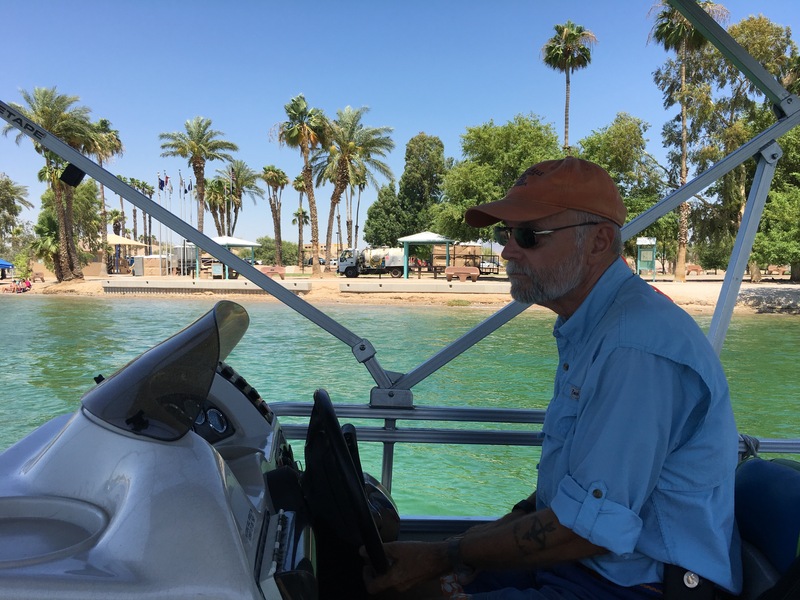 Lake Havasu – rented 24′ pontoon boat. So much fun. Explored the lake, Uma swam around, played in the water, went under the London Bridge, enjoyed the crazy energy. Can’t imagine what spring break would be like there. Refrigerator broke – unplanned trip to Las Vegas to get fixed. Won money, lost money, saw Cirque du Soleil, Beatles LOVE – strongly recommend, music brought back great memories mixed with the crazy Cirque du Soleil performers. Cedar City, Utah, Hiked the Kolob/Zion National Park trail. London Bridge is not falling down. 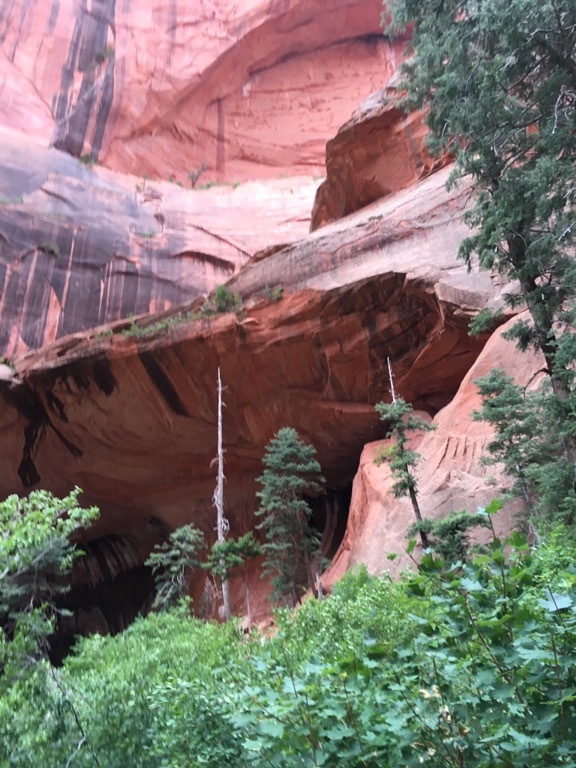 Thursday, June 30, Kenny and I hiked an easy, family friendly trail in Kolob/Zion National Park. Taylor Creek hike is protrayed as an easy to moderate hike of ~5 miles round trip to the Kolob Double Arch Alcove. Research through normal googling, this hike appeared to be perfect for us. Not too long, not too difficult. Temperatures were high but much lower than our recent visit to Las Vegas. We packed up some water and trail bars and headed off early pm to the Taylor Creek Trail. 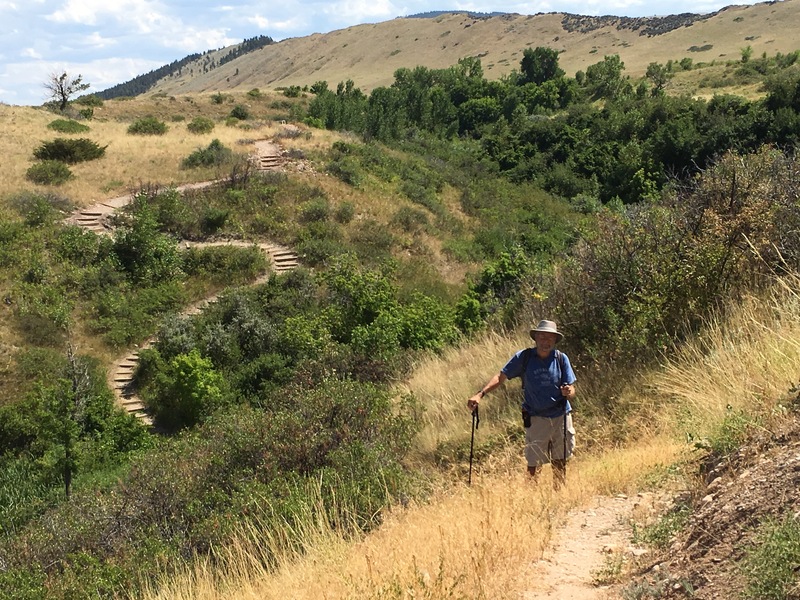 The day was perfect, less than 90 degrees, the trail was shady in many areas and meandered pleasantly across the “creek”, easily crossed without getting your shoes wet, and, in some cases completely dry. It was hot, there were few people on the trail, and there were no warnings of impending rain. We checked in with the Ranger and told him which trail we were hiking. Surprisingly, we didn’t have to give him our names or sign in on a board at the trailhead. What a beautiful hike, clearly marked with steps and slopes running up and down along the sides of the creek with plenty of picturesque views of imposing canyon walls. To the Double Arch Alcove, it was 2.5 miles of criss-crossing the Taylor Creek at least 20 times (I don’t think I am exaggerating about this I but don’t know for sure). A great hike by all standards. Ken and I arrived at the Double Arch and were taking our pictures when lightening and thunder started. We had just appreciated the wonder of the canyons’ rock formations that were shaped thousands of years before our time. How insignificant are we in this world? A true lesson of humility. With the rain started, we knew we had to move swiftly. We joked that if we had more lightening we would need to put away our walking sticks or Dan and Nikki would have the most extravagant wedding they could ever want. We laughed that we may have to be crossing the creek with water up to our waists. We laughed without knowing of what was coming next. More lightening, we secured our walking sticks, and we were moving quickly back to the trailhead. We ran into Martin seeking shelter under a rock cliff. He had been waiting out the storm. We told him that the creek was rising and that we felt that we needed to keep moving. Although we watched the creek swelling more with each crossing, we weren’t really aware of the danger. As the mountain walls began weeping crystal waterfalls, I made Kenny stop to take some pictures. It was truly a wonderous sight. As he was snapping, a few hundred feet ahead of us on the opposite shore of the ever-increasing creek, a mudslide occurred with a roar, slid down from high above the canyon wall and dumped mounds of red mud into the creek. Now we were racing the mud. As long as we could stay ahead of the muddy, red water, we would be able to see how to safely cross. We were scurrying now but didn’t win that race. We were about 1.5 miles away from the trailhead. Kenny and I were seeking higher ground when Martin caught up with us and joined us recognizing that the storm wasn’t ending and the creek was now a river. When I saw a tree being dragged down the river rather swiftly, I was really concerned. Both Ken and Martin remained calm. Kenny headed up the bank of the river to see if he could find a path that would lead us to a crossing that was safe. When he found a “critter path”, Martin and I pulled aside the bramble brushes and moved up higher. I was slipping on the mud and not getting good hand holds to pull myself up. Ken and Martin were encouraging, Ken from above and Martin from below. With all of us safely on higher ground, we kept moving looking for a location where we might be able to safely cross. 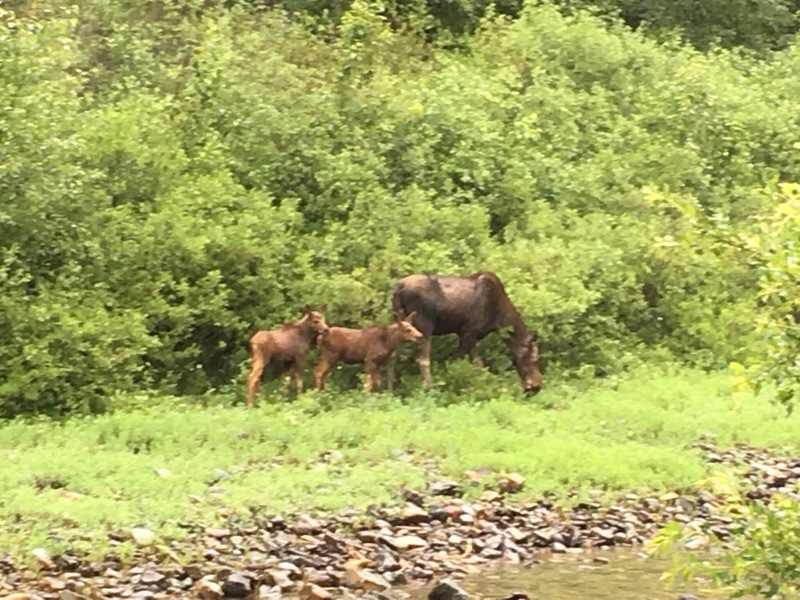 Then, we saw a young couple below us and they had crossed the river safely! Ken yelled down to them. They had crossed side-stepping facing the current – holding hands. Kenny asked if they’d wait for us to join them and they quickly agreed. Safety in numbers! For the rest of our 1.5 mile journey of crossing the creek/river now raging with strong currents, we chain-linked arms/hands and successfully crossed the water 5-6 times over stones we couldn’t see, depths we didn’t know, and currents that varied as we crossed, all working together to ensure that each of us safely reached the other shore. Joe, as first in our chain, let us know where there were dips, larger stones and how strong the current was even though he was shivering from the cold. Joe and Andraya examined the course we would take at each crossing, the water flow, where to go in and where to get out. Then, we’d lock our arms and side-step the waters, facing the current. We crossed, Joe, Andraya, Martin, me and Kenny, arms braced on arm. Between the creek crossings, there was hiking that allowed some small talk and we found out some small details of the lives that we were depending on. We reached the parking lot safely, quietly, extremely cold, muddy, and so, so thankful. We clicked selfies, lined up the way we crossed, to commemorate our survival. Shook hands, hugged, exchanged e-mails and headed home with the car heater on and fingers that were numb. Thank you God for our safe arrival at the trail head. Thank you for sending our new friends to ensure safe crossing. 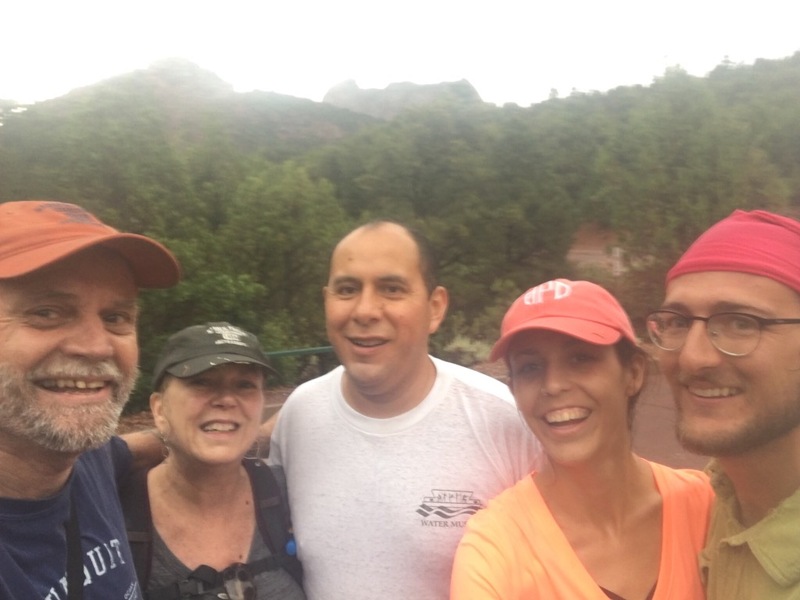 From Joe and Andrayas – Yesterday was quite an adventure. As we reflected yesterday evening, we found ourselves in awe of the power of this place, sore from clenched legs and jaws, and grateful to have found comrades to share in our bull-headed quest to get out. What began as an ordinary hike, which Andrayas was not interested in going on in the first place, turned into an unforgettable experience. As we began to make our way back toward the parking lot from the alcove, the rain was falling and we walked quickly. When we came across the first crossing, we stopped to take stock of the situation. While yesterday was certainly the first time either of us had been in such a situation, I recalled lots of survival learning that I have done over the years regarding hypothermia, floods, etc. We waited for a while and decided to go forward, but before we did we spent some time looking up at the canyon walls and marveling at the waterfalls that appeared where there was only hot dry rock a few minutes earlier. I remember early on during the storm shouting with joy at the energy that the storm seemed to send through us. Things got more frightening as we came to more and more stream crossings and saw more and more washes emptying into the creek and swelling it higher and higher, sometimes obscuring the trail. At some point where two branches of the creek, about equal in size, we became fearful that our successful crossings were at an end. We sat and waited for the storm for about 20 minutes. Growing up in the west, I’m used to short, powerful storms. However, yesterday my expectations were wrong. After shivering under the tree with no sign of the rain abating, the wind began to kick up and my fears of hypothermia became more real than I could have ever expected. We decided to press on, soon coming across the three of you. Strength in numbers is not to be questioned. Suddenly, we were certain that we would all make it out okay. Crossing the creek in the deepest and fastest moving water we saw yesterday suddenly seemed natural and simple. While the moments of life and death fear were minimal, they were certainly enough to remind us what true fear feels like. We found ourselves in a beautiful and powerful place, and while Andraya and I were reflecting last night, we tried to remember the beauty that we saw in the canyon. Beauty that could not be captured in a picture, and that could have been easily overlooked and suppressed due to the feeling of fear that came with it. We talked about the waterfalls and the surges of water, we talked about the thousands of pounds of silt that were brought past us, silt and sediment which were probably on rocks thousands of feet above our heads just moments before and only visible in the dark red color of the water. It was truly an incredible moment we experienced and we’re glad to have shared it with you. I would like to think that yesterday was, for me, both a lesson of humility and a reminder that we are in the world to team up, and to help each other. The lesson in humility comes from many angles, but particularly two. First, it was a very vivid reminder that those beautiful formations in front of us came from the power of the little creek, later turned into what we saw, and if it had the power to transform mountains, it certainly could have the power to transform my plans, and possibly my life at that moment. Second, it was also a lesson in humility reminding me that there is so much to learn and that comfort is sometimes taken for granted. Naively, I had waited for a long time under a rock before Deb and Ken came along, avoiding the rain thinking because I did not want to get wet. Well, it became obvious at some point that getting wet was going to be the least of my concerns. The second lesson showed me again that, despite the fact that we often believe that we are independent and thinking that we construct our path, the reality is that all of us, in one way or another, help each other, and it could not be more evident than when we were under distress yesterday. At the end, it left me feeling to have worked together with you, without any other interest than helping each other. It renewed my hope that we all can work together in society, if we just realize how much we need each other.